Join Us!!! We are looking for someone to help us cover NBA basketball. Please send us an e-mail. The Road Less Travelled Alen Smailagic Journey to the G-League! Utah Jazz Apr.22 Houston R.
Orlando M. Apr.21 Toronto R.
Indiana P. Apr.21 Boston C.
S.Antonio S Apr.20 Denver N.
Luke Walton fell victim to unreasonable expectations. Despite (mostly) steady annual improvement since a franchise-worst 17 wins in 2015-16, save for this drama-filled and injury-riddled campaign, the Los Angeles Lakers parted ways with Walton Friday following his third season at the helm and first directing LeBron James (6'8''-SF-84), calling it a mutual agreement in the press release. "We would like to thank Luke for his dedicated service over the last three years," Lakers general manager Rob Pelinka said in the statement. "We wish Luke and his family the best of luck moving forward." "I want to thank Jeanie Buss and the Buss family for giving me the opportunity to coach the Lakers," added Walton. "This franchise and the city will always be special to me and my family." The 38-year-old posted a 98-148 record at the command of the Lakers, but the first-time head coach's lack of success in L.A. is far more nuanced than that. Walton inherited a team that was ripped to the studs by Kobe Bryant's retirement tour and propped up by a pair of the NBA's worst contracts - Luol Deng and Timofey Mozgov, one of whom is still cashing checks not to play for the Lakers and the other of whom cost them their No. 2 pick from 2015 in a salary dump. Starless and cap-strapped is not the best starting point, but Walton built the crop of draft picks who followed into a team attractive enough to lure LeBron to Los Angeles. LeBron's arrival, along with the hirings of Magic Johnson and Rob Pelinka to run the front office, came with playoff - and title - expectations. This, despite the fact that Johnson and Pelinka put their team-building effort on hold until 2019 by signing a cast of characters to one-year deals. There was every reason to believe the piecemeal Lakers would start slow and struggle to challenge the Western Conference elite at the jump, so naturally Johnson admonished Walton for both his offensive and defensive schemes in a meeting eight games into the season. All that said, Walton's Lakers were in fourth place, two losses out of the No. 2 seed, when LeBron suffered a groin injury on Christmas that cost him three weeks and lingered until he was shut down for good. Season-ending injuries to Lonzo Ball and Brandon Ingram also followed. The Lakers predictably fell out of the playoff picture. The team also engaged in trade talks with the New Orleans Pelicans to acquire Anthony Davis that included half the roster and ultimately failed. Even the Lakers concede this created a chemistry problem that contributed to the team's tailspin. None of this was Walton's fault. You can only accomplish so much when your front office hands you a star, demolishes the locker room, and that star strains his groin. Earlier reports suggested Lakers owner Jeanie Buss would resist efforts to put Walton on the chopping block, but she recently softened on that stance, and the front office apparently convinced the powers that be that the coach was culpable for the slip in the standings, not LeBron's injury or an oddly constructed roster. In his wake, Walton leaves a pair of No. 2 overall picks who failed to meet the projections the Lakers set for them and two late first-round picks who exceeded all expectations in their first two seasons. His record was a mixed bag, to be sure. Now, the Lakers must find a coach who balances the weight of Lakers and LeBron exceptionalism with the player development of Ingram, Ball, Kyle Kuzma and Josh Hart. Candidates range from the forgotten to the familiar, with a host of unproven prospects in between. There is no guarantee that the next coach will be better than Walton, and there is no evidence to suggest Johnson and Pelinka can find one who is. The one sure bet is that the Lakers will consider every coach whose name would look good on an L.A. marquee. Don't be surprised if Phil Jackson is involved. From Mike Brown to Erik Spoelstra to David Blatt and Tyronn Lue, LeBron has clashed with every coach he has ever had, save for Walton - as far as we know. Understanding the learning curve, LeBron previously pledged support for Walton following Johnson's admonishment. The next coach will surely have LeBron's endorsement upon his or her hiring, but there are no assurances beyond that. Meanwhile, Walton's name will appear in every other coaching search around the NBA. The 39-year-old's resume includes a 39-4 start as interim coach of the Golden State Warriors during their 73-win 2015-16 campaign. There have been offensive struggles in L.A., for sure, but the Lakers' dearth of 3-point shooters in an era when that shot has taken hold did not do Walton any favors. The Lakers' defense under Walton improved from dead last in Year 1 to 13th in Year 2 and top-10 this season before the late-season landslide. That is the sort of year-over-year growth most rebuilding teams would like to see from a young roster. It is not what the Lakers wanted from Walton once LeBron signed. That they expected anything more from a team that lost its best player for a good chunk of the season makes you wonder if Johnson and Pelinka were looking for any excuse to fire Walton and bring in their guy. But the front office only gets one chance to axe an incumbent coach, and next time any shortfall of expectations will be on them. 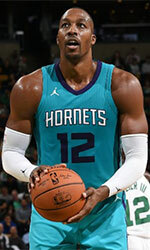 The Wizards are set to have Dwight Howard (6'11''-C-85) back for a second year, as the veteran center informed the team of his plans to exercise the $5.6 million player option in his contract for the 2019-20 season, NBC Sports Washington has confirmed. Howard, 33, indicated to Wizards brass in his exit meeting last week he was likely to opt in to the second and final year of his deal, but there was some thought he would wait until closer to the June 29 deadline. The reason why is Howard's continued recovery from the back surgery he had in November, a procedure that kept him sidelined for the final five months of the season. But Howard has now made his intentions known, giving the Wizards a clearer picture of their offseason. With him in the mix, they essentially have five players under contract next season. They technically have six, though Jabari Parker's $20 million team option is essentially a lock to not be picked up. Howard appeared in only nine games in his first season with the Wizards. He missed all of training camp and their preseason schedule with back issues, played for just over two weeks in November and then went down for the year. He had the surgery, a lumbar microdiscotemy, on Nov. 30. Though his time on the floor was brief, he put up solid numbers with averages of 12.8 points and 9.2 rebounds. The Wizards missed his rebounding in particular, as they finished 27th in the league in the category and 28th in rebounds against. Howard will certainly hope for a better showing in Year 2 with the Wizards, though there may be no guarantee he actually comes back. The Wizards are currently searching for a new general manager, and that person could choose to go in a different direction if ownership permits them to. Keep in mind last summer Howard was traded soon after Mitch Kupchak took over the Hornets' front office and the Nets bought him out immediately after acquiring him. Howard's $5.6 million salary is relatively inexpensive, as Brooklyn paid $18.9 million to part ways. Time will tell if Howard's career continues in Washington, but for now he is slated to come back next season for a second year with the Wizards. ESPN's Zach Lowe first reported the news of Howard opting in. 76ers outgunned Nets to take 2-1 lead in the series. 76ers made 30-of-35 charity shots (85.7 percent) during the game. 76ers outrebounded Nets 54-43 including 39 on the defensive glass. Their players were unselfish on offense dishing 26 assists comparing to just 12 passes made by Nets' players. Nets were plagued by 24 personal fouls down the stretch. It was an exceptional evening for Tobias Harris (206-92, college: Tennessee) who led the winners with a double-double by scoring 29 points and 16 rebounds (perfect behind the arc making all six shots !!!). Australian point guard Ben Simmons (208-96, college: LSU) accounted for 31 points and 9 assists (on 11-of-13 shooting from the field) for the winning side. Guard Caris LeVert (201-94, college: Michigan) came up with 26 points and 7 rebounds and DAngelo Russell (196-96, college: Ohio St.) added 26 points respectively for Nets in the defeat. Four 76ers and five Nets players scored in double figures. Both coaches tested many bench players and allowed the starting five to rest. Warriors bounced back from the loss in Game 2 and stunned Clippers to regain the advantage. Warriors had a 40-27 advantage in offensive rebounds. They looked well-organized offensively handing out 35 assists comparing to just 21 passes made by Clippers' players. Great defensive blocking was one of the keys in this match when Warriors made 11 blocks. The best player for the winners was Kevin Durant (206-88, college: Texas) who scored 38 points (!!!) and 7 assists. Point guard Stephen Curry (190-88, college: Davidson) chipped in 21 points and 5 rebounds. At the other side the best for losing team was Croatian center Ivica Zubac (216-97, agency: BeoBasket) who recorded a double-double by scoring 18 points and 15 rebounds and Lou Williams (185-86) added 16 points and 6 assists respectively. Four Clippers players scored in double figures. The winner was already known earlier in the game, so both coaches allowed to play the bench players saving starting five for next games. San Antonio topped Denver en route to the second victory in the series. Spurs dominated down low during the game scoring 74 of its points in the paint compared to Nuggets' 54. They looked well-organized offensively handing out 24 assists. It was a great evening for guard Derrick White (196-94, college: Colorado) who led his team to a victory scoring 36 points (!!! ), 5 rebounds and 5 assists. Swingman DeMar DeRozan (201-89, college: USC) helped adding 25 points and 5 assists. The best for the losing side was Serbian center Nikola Jokic (209-95, agency: BeoBasket) with 22 points, 8 rebounds and 7 assists and guard Malik Beasley (196-96, college: FSU) scored 20 points and 9 rebounds. Both teams had five players each who scored in double figures. Both coaches used bench players which allowed the starters a little rest for the next games. Houston celebrated the second straight win over Utah. Rockets made 25-of-30 free shots (83.3 percent) during the game. Great defensive blocking was one of the keys in this match when Rockets made 9 blocks. 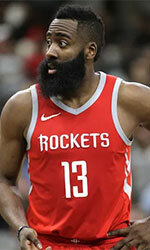 The best player for the winners was James Harden (196-89, college: ASU) who had a triple-double by scoring 32 points, 13 rebounds and 10 assists. Point guard Chris Paul (183-85, college: Wake Forest) chipped in 17 points. Spanish guard Ricky Rubio (193-90) produced 17 points, 9 assists and 4 steals and forward Derrick Favors (208-91, college: Georgia Tech) added 14 points and 12 rebounds respectively for the hosts. Both teams had four players each who scored in double figures. Both coaches tested many bench players which allowed the starters a little rest for the next games. Celtics topped Pacers to take 2-0 lead in the series. Celtics outrebounded Pacers 48-36 including 41 on the defensive glass. Their players were unselfish on offense dishing 22 assists. Australian-American guard Kyrie Irving (190-92, college: Duke) notched 37 points (!!! ), 6 rebounds and 7 assists to lead the effort and forward Jayson Tatum (203-98, college: Duke) supported him with 26 points. Even 23 points and 8 rebounds by Croatian Bojan Bogdanovic (203-89) did not help to save the game for Pacers. Forward Thaddeus Young (203-88, college: Georgia Tech) added 15 points and 6 rebounds for the hosts. Four Pacers players scored in double figures. Pacers' coach rotated ten players in this game, but that didn't help. Bucks had little trouble outscoring Pistons in Milwaukee for the second straight time. Bucks dominated down low during the game scoring 72 of its points in the paint compared to Pistons' 50. They outrebounded Pistons 54-43 including a 46-32 advantage in defensive rebounds. Bucks looked well-organized offensively handing out 32 assists. Great defensive blocking was one of the keys in this match when Bucks made 11 blocks. Greek-Nigerian swingman Giannis Antetokounmpo (211-94, agency: Octagon Europe) had a double-double by scoring 26 points, 12 rebounds and 4 assists to lead the charge for the winners and forward Khris Middleton (203-91, college: Texas A&M) chipped in 24 points, 5 rebounds and 8 assists during the contest (was perfect 8-for-8 from the free throw line). Four Bucks players scored in double figures. Center Andre Drummond (208-93, college: Connecticut) responded with a double-double by scoring 18 points and 16 rebounds and point guard Reggie Jackson (190-90, college: Boston Coll.) scored 18 points and 8 assists. The winner was already known earlier in the game, so both coaches allowed to play the bench players saving starting five for next games.